...this isn't my typical genre, but it's a fascinating glimpse at the food industry! This is not a diet book. While it is probably considered a health book, it could easily be shelved in the political/current affairs section of any bookstore. Because what it talks about goes far beyond weight and waistlines into the very political structure of the weight-loss industry and big business. Sure, it talks about how unhealthy most Americans are, and without a doubt the most troubling aspect is the rising obesity rates in children. But, given how many low-calorie and "diet" options are out there, why aren't people eating better? "When fast-food restaurants position themselves as healthy, customers tend to underestimate the calories....and choose higher-calorie side dishes, drinks, or desserts." Think Subway plus that lovely chocolate chip cookie next to the register, which is okay now, because the sandwich was so healthy! 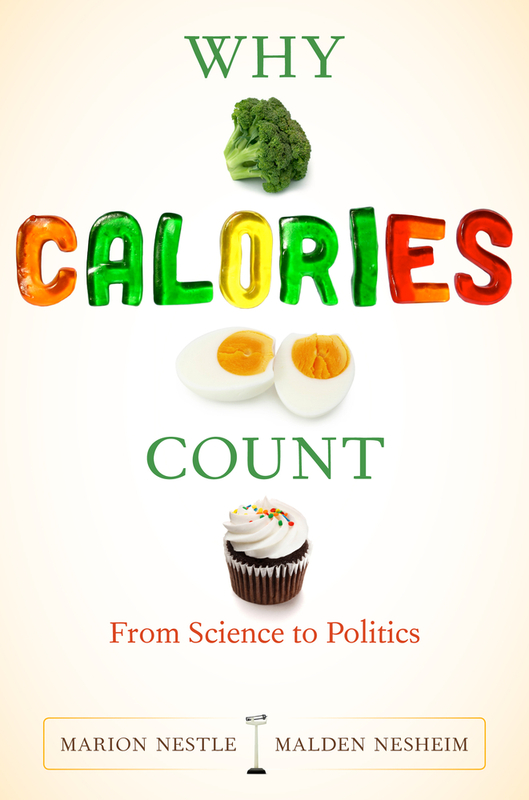 "When portions are labeled small, people believe they are eating fewer calories regardless of the number of calories the foods contain or their actual size." So small fries aren't really great even if they are small. Damn. "When Oreo cookies are labeled as organic, people perceive them as having fewer calories than conventional Oreos....even when the study subjects have been shown package labels indicating their calories are equal..." Yikes. Another surprise: if the label grants that the product has some beneficial component, such as "vitamins added" or "contains probiotics", many of us will assume it's healthier and thus the calories "don't count nearly as much". Ouch. Then it looks at some diet claims: apparently the Negative Calorie Diet claims that eating certain foods will make the body burn calories instead of store fat. Of course, it's not possible, and the dynamics of the claim are analyzed. 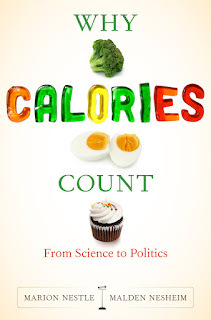 One example of this is given of how people interpret or imagine calories work when faced with a choice. Sort of like the "diet coke plus cheeseburger" phenomenon we may not want to admit to, this one is disturbing. A scientist did an experiment with bowls of chili and salad. With the chili alone, participants guessed that the portion contained 700 calories. But when the same bowl of chili was placed with a green salad, they guessed that the meal was 655 calories. That somehow, the salad magically eradicated chili calories! Beyond those terrible details, there's the whole idea of how badly we underestimate portions, and how even children aren't able to understand what is or isn't reasonable. What makes this such an issue is that junk food and high-calorie treats are big business; manufacturer's aren't really interesting in you eating less because you'll buy less. Sure, they may offer a 100-calorie snack pack, but the increased price makes up for their losses. And it's sort of disturbing to see just how involved this large corporations get into political lobbying to keep healthy food out of schools, and using this power to simply redesign their products to gain imaginary approval. It seems like the cards are stacked against anyone eating healthy, but this shows ways a consumer can analyze ridiculous claims, see through the hype, and understand just how nutrition works. Also, with that knowledge, a person can make better choices and realize just how much a business model is manipulating their health. One area I would have like to seen explored a bit more is just how to make good choices for people on the go for whom the worst of the food choices are aimed. I'd like to be able to explain to my sons why a Monster energy drink and a King Size Snickers is not a meal, because their crazy schedules don't allow them much time for planning or prepping something healthy. A list of "yes, you can buy this at 7-Eleven before work and still be healthy" foods would have been nice, but probably not realistic. And I think that is another point the book makes very clear: we are in charge of our health. We can't leave it to fast-food companies or convenience stores to provide the healthiest choices...they simply have no incentive to do so unless people change their habits. It really can't be left to chance or as an afterthought. Special thanks to Kathlene Carney for the Advance Review Copy. I have read Marion Nestle before and like her rational approach and very clear way of explaining food science. Looking forward to reading this one too. I thought that lettuce was a "zero-calorie" food- that your body takes more energy to digest it than it gets from it- so you actually loose calories by eating it. Maybe others have that idea too, and that's why they think salad cancels out some chili?